It was one of those glorious late summer mornings in Sydney – clear enough to go exploring under a brilliant blue sky, and enough cloud cover to fend off oven temperatures. We set off with the aim of exploring some part of our new home city. A friend suggested we try some desserts at Lakemba, so off we went. 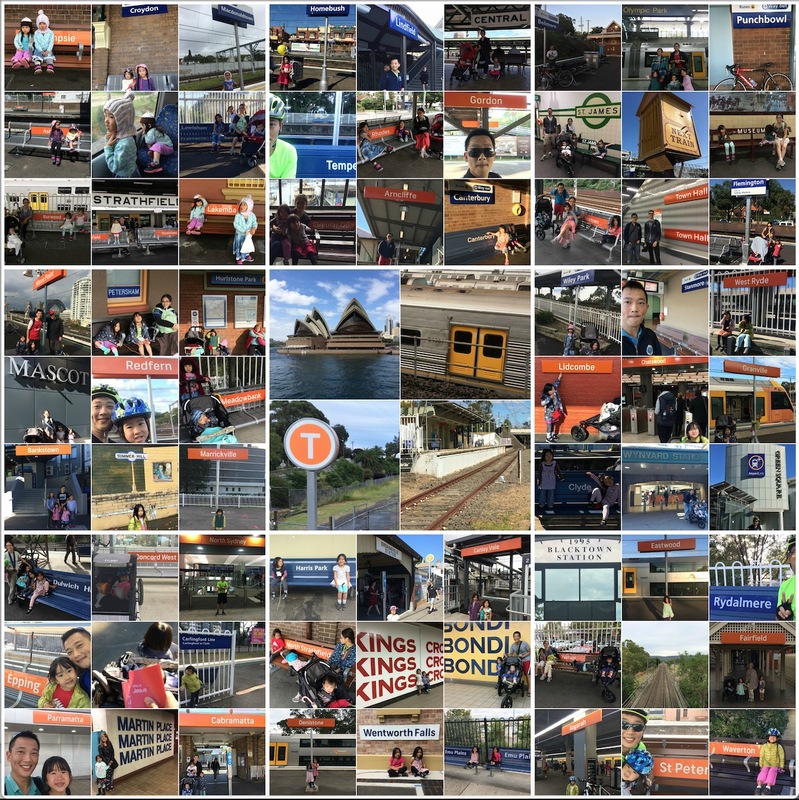 A simple request kickstarted a family project that, 68 stations later, still brings beautiful sights, culinary delights, and God-given insights about communities, journeying together, and living life as people “passing through”. Sydney is beautiful. But it’s a beauty that goes beyond the postcard-quality harbour views at Circular Quay and Milson’s Point Stations, or the picturesque entrance into the Blue Mountains at Emu Plains. There’s also a raw, unscripted beauty in seeing crowds hustle between platforms at Central Station, the early-morning market shoppers at Flemington Station, and the swirl of grunge and rainbow hairstyles at Newtown Station. There’s also the quiet serenity of sailing towards the Blue Mountains in the quiet carriage, the suburban station that’s synecdoche for home (Croydon), and the experience of walking through a city of gravestones pondering the brevity of life (Lidcombe). Culinary delights – yes! Travelling between Sydney suburbs can seem like sliding between alternate universes. At one stop you’re enjoying hipster brews with yuppies and power-parents (Dulwich Hill), at the next you’re scarfing down dumplings (Ashfield). Try some Indian curry (Harris Park) or Bangladeshi desserts (Lakemba). Slurp some Vietnamese Phở (Cabramatta) or Taiwanese beef noodles (Eastwood). Can’t decide between Asian or Middle Eastern for lunch? Then fill up with both Laotian and Iraqi cuisine either side of Fairfield Station. Of course, a city is more than its food. Travelling on trains (bikes, buses, ferries too) allows the kind of personal interactions that we often zoom past in our automobile-induced amnesia. After all, it’s only by travelling slowly that you meet complete strangers, hear their stories, and even share Christ with them. In our train station hunt, we’ve met humans of Sydney from all walks of life: people sleeping rough, retired grandparents, fellow parents, tourists, business-people, and other thrill-seeking children. It’s their individual stories that stay in the memory: the grandfather fretting about his grandchildren’s future, or the refugee who’s found job-seeking a racially-discriminatory disappointment, or the man who simply wants the dignity of buying a meal this day. Train networks also serve as etched evidence of our innate inclination to settle in homogenous communities. There are unmistakable trends in who lives where. Upper-middle class families in North Sydney and the Hills, working-class people in the West and Southwest, Koreans in Strathfield, Nepalis in Granville, Lebanese in Punchbowl, Italians in Leichhart. Residents of Sydney who coalesce into ethnic, religious and socioeconomic tribes. Godly unity brings strength. Sinful unity foments mistrust and race riots. In this I’m reminded that Jesus came to break down the dividing wall of hostility by creating in his death on the cross one new man in place of two, so making peace (Eph 2:14-16). In God’s Kingdom there won’t be segregated communities to train through. And even if train lines carve divisions (they talk about the Chinese side and the Korean side of Eastwood, for example), true gospel communities can bridge those divides through the shed blood of Christ. Paul is convinced that standing firm in our heavenly citizenship empowers us to press on towards knowing Christ more. I think this truth is more vivid this year for us, living life in transition. When you know you’re just passing through somewhere, you’re motivated to make the most of your time: to take photos, try what we can, and come away enriched and grateful. Just as we visit most train stations wondering if we’ll ever come back, we’re making friends, pursuing gospel opportunities, reading and studying, knowing that our season is temporary. Perhaps here God gives us a parable for the Christian life: if this life isn’t our final destination, if we are just passing through this station, then we should live differently. Spend differently. Read differently. Relate differently. Try things more spontaneously. Share Christ more courageously. Love our fellow sojourners more fervently. Our citizenship in heaven affects our choices on earth. Hours separate us from the dawning of 2018. This year has been like no other for the Chongs. We’ve ached for friends departed, and welcomed new ones. Our first year here has pulled at our minds and hearts. Our marriage and parenting has been a fishbowl experience, filled with God’s mercy amidst our failures. Only the LORD knows all the joys and struggles next year will bring. But one thing’s certain: there’s two more years to go and 110 more stations to visit. I’m not sure if we’ll get to them all. But by God’s grace, our family is certainly richer for the journey. Arncliffe – Explored this cliffside station while waiting for an airport pickup. Bought a 7-up with label in Arabic. Tasted like normal 7-up. Ashfield – Ian runs a lovely cafe across the street that does cheap, tasty Malaysian food. Auburn – H and I enjoyed a “babycino” and some baklava. Street signs a fusion of Lebanese, English and Chinese. Bankstown – A lovely afternoon catching up with the McMahans. Belmore – Met George, a lapsed Greek Orthodox who’s lived here for years. Takes the train to Liverpool for work each day. Blacktown – This was a busy, crowded toilet stop for one of our kids. The $1 slushie was nice. Bondi Junction – Busy waiting for a bus to Bondi Beach. Could the train not have extended to the seaside? Burwood – Our starting point for many adventures. The BBQ lamb shop across the road always seems like its on fire with all the smoke coming out. Cabramatta – Come here and find a special gate, interesting fruits and yummy food. No longer the infamous heroin capital it used to be. Campsie – Albee’s Kitchen is here. Where else can you get Kuching laksa this good? Canley Vale – Bought some pork buns for the girls enroute to Cabra-vale Park. Carlingford – We came here to attend Michael Abel’s memorial service. Central – The grand concourse with its high dome and giant Victorian-era clock feels like a scene from the movies. Chatswood – Met Amelia and the twins here! The largest shopping mall complex we’ve ever seen. Circular Quay – Postcard views of the Sydney Harbour. Tourists galore. Lunch on the Opera House steps is great. Clyde – We walked here from Granville Memorial Park once and the girls had fun hiding inside a pole. Concord West – Took H here and cycled around Olympic Park reserve. Easier to access the Brick Pit Ring Walk from this station. Croydon – We went for a walk from home one day and 20 minutes later we reached our closest station. Denistone – Walked past a house auction – $2 million for a full-section 4-bedroom house. Dulwich Hill – Came here for some fish and chips. Plenty of fancy food places here. Eastwood – Went to the Taiwan Night Market for dinner. Emu Plains – Got off to view the Blue Mountains from Sydney’s vantage point. Nearly got fined for forgetting to tap on again! Epping – We got off here on the way to Carlingford once. Big screen TV ad hangs over the pedestrian bridge. Erskineville – H and W walked here from Macdonaldtown Station. A few bikes passed us on the way. Fairfield – Went to the massive adventure park, and had Laotian crispy fried rice for lunch. Flemington – The Sydney Markets are here. Rows and rows of stalls, people selling anything and everything: flowers, fruit + veg, garage sale-type stuff. Gordon – The cafe across the road does Nitro Coffee (cold brew). Wow! Granville – We found a park with trees that had monkey apples. Nirwan and his mum played with us at the Memorial Playground. Green Square – Caught up with Greg Cooper for lunch and a yak about church music. Homebush – E and W found a Russian Saturday school and ate some пирожки (piroshki). Hurlstone Park – Got off the bus here once enroute to see Jared and Kristy in Marrickville. Kings Cross – Stopped here to have morning tea on the way to Bondi. Famous Coke sign has been upgraded. Kogarah – Cycled to Brighton le Sands with E and went home via this station. Lakemba – A suburb that’s 59% Muslim based on the 2016 census. Bangladeshi sweets were nice, Jasmin’s Lebanese even better. No Christmas tree on the street corner. Lewisham – This is our stop every Sunday morning to get to church. Lidcombe – We walked to Rookwood Necropolis from here. One grave was for a child who died at 11 months. Lindfield – W handed out flyers here while on East Lindfield college mission. Macdonaldtown – Closest stop to Moore College. Lots of “sleeping trains” here. Marrickville – Saw a big cargo train roll past here. Met up with Jared and Kristy for lunch in the park. Martin Place – Brought Ashleigh and Jayana here to go visit the Hyde Park Barracks. Meadowbank – Took the ferry from here to Circular Quay along the Parramatta River. Newtown – Burgerfuel here! Also lots of rainbow flags and a very alternative bookstore. North Strathfield – Komart here has a great range of Korean snacks. North Sydney – W cycled here one morning. Crossed the Harbour Bridge at dawn. Olympic Park – Brought Christian here. There was a big fountain where E got very wet! Parramatta – Wandered around the town square and visited St Johns Cathedral (parish of Samuel Marsden, the “apostle” to Aotearoa New Zealand). Petersham – Two Fat Greeks does a delicious souvlaki. Also can’t beat Gelato Republic. Punchbowl – W cycled here one morning. Station looks unwelcoming, Lebanese shopkeeper was the opposite. Redfern – E and W did a Food Ride with some other cyclists. Had to carry bike and trailer up the stairs. Rhodes – IKEA is here. Rydalmere – W cycled to here one morning, went along the southern bank of the Parramatta River. St James – Came here after exploring Hyde Park with Christian. Has an old-style food bar inside. St Peters – Came with H to explore Sydney Park on the bike. Stanmore – School of Theology with Prof Guy Waters at Stanmore Baptist. House prices too high for church members to live here. Strathfield – The square has a lovely fountain, Jacob makes a great coffee, and lots of people have time to take a tract or talk about Jesus here. Summer Hill – A trendy place to live. Lots of dogs as pets here. The IGA has a cheese room. Waverton – E and W cycled here one morning, via Harbour Bridge. West Ryde – Koorong is here! Wiley Park – Found a community veggie garden. South Asian women with their children in the playground. Wynyard – Another stop where people are happy to sit and read about Jesus, if you offer a tract to them. John Dunmore Lang’s statue is here. This entry was posted in Cycling, Personal, Sanctification, Seminary, William, Year in Review and tagged chongkids, sydneytrainhunt on 30 December, 2017 by W C.